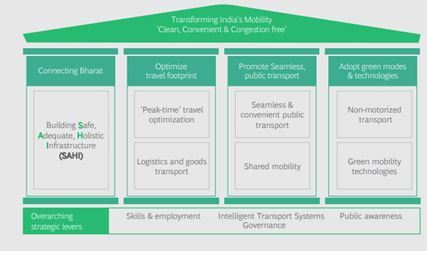 Context: Recently NITI Aayog and Boston Consulting Group (BCG) presented a report titled “Transforming India’s Mobility- a Perspective” at the Global Mobility Summit, 2018. Indian cities are characterized by increasing levels of congestion, pollution, road accidents and inequality in access to mobility. The need for better urban mobility in order to build inclusive, safer and more sustainable cities cannot be underestimated. Buses are the prime mover for both inter-city and intra-city travels in most urban centres. However, in recent times there has been a loss in ridership. Other modes include metro rail, trams, and local trains. Only Mumbai, Kolkata, and Chennai have extensive suburban rail services whereas Delhi has limited suburban rail services. Unprecedented Transport Growth: According to Niti Aayog, the number of registered motor vehicles has increased from 5.4 million in 1981, to 210 million in 2015 . This rapid growth in demand in the absence of widespread public transport system has caused a rapid increase of private car ownership in India. Inadequate Public Transport: According to government data, there are about 19 lakh buses in the country and only 2.8 lakh of them are run either by state transport undertaking or under stage carriage permits. Urban Pollution: According to a WHO study 14 out of the top 15 most polluted cities in the world belong to India. Vehicular pollution has been one of the major contributors to rising urban air pollution in Indian cities along with other factors such as construction activity, road dust and industrial activity. Urban Congestion: Major Indian cities like Delhi, Mumbai, Kolkata and Bengaluru are ranked among world’s most congested cities. For example: Average speed for vehicles in Bengaluru is reported as 17 km/h. These high levels of congestion have huge economic implications in the form of reduced productivity, fuel waste, and accidents. Further, there is an acute shortage of parking spaces both on and off the streets in the urban centres. Road safety- Traffic injuries and fatality: According to the Report ‘Road Accidents in India-2016’, road accidents in India have decreased by around 4.1% in 2016 from 2015. However, fatalities resulting from these accidents have risen by about 3.2%. The major reasons for traffic crashes include poor quality of roads, poor traffic management, unsafe and overcrowded vehicles and unsafe driving behaviour. Equity Issues: Unplanned urbanization in India has led to gentrification (as per upper and middle socio-economic class) of city centres and lower income groups are forced to live in peripheral suburbs which have increased their cost and time they allocate to commute. 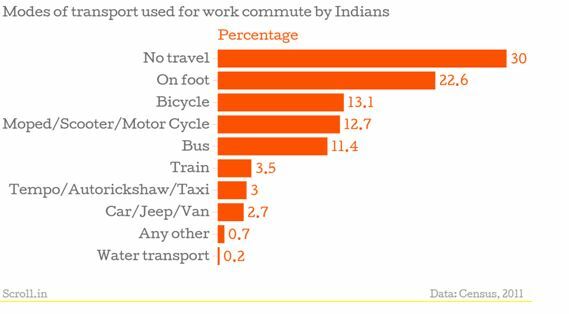 Most of the lower income groups and urban poor fail to afford private transport and even public transport are high for them. For example, a CSE study ranks Delhi Metro as the second most unaffordable metro (after Hanoi in Vietnam) with lower income group people spending nearly 22% of their monthly transport on Delhi Metro fares. Mobility for women: Safety or the lack thereof, is the single biggest factor constraining women’s mobility. According to Action Aid UK, 79% of women in major Indian cities reported being harassed on streets. Overcrowding in public transport adds to insecurity and safety issues with a large number of women complaining about harassment in public transport across major Indian cities like Delhi and Mumbai. Jawaharlal Nehru National Urban Renewal Mission JNNURM, 2005:JNNURM was launched in 2005 and closed in 2014 (now succeeded by Atal AMRUT Mission). It attempted to improve the public transport system in larger cities through funding of public transport buses, development of comprehensive city mobility plans and supporting city transport infrastructure projects. National Urban Transport Policy, 2006: The policy envisages safe, affordable, quick, comfortable, reliable and sustainable urban transport through establishment of quality focused multi-modal public transport systems. Green Urban Transport Scheme, 2016:. The scheme aims to improve non-motorised transport infrastructure such as dedicated lanes for cycling, pedestrians, increasing access to public transport, use of clean technologies and adoption of intelligent transport systems (ITS). Mass Rapid Transit/ Transport Systems (MRTS): The metro rail has come up as a favoured alternative of mass transport in Indian cities. In 2017, the government introduced new Metro Policy which aims to improve collaborations, standardising norms, financing and creating a procurement mechanism so that the projects can be implemented effectively. National Transit Oriented Development Policy, 2017: The policy framework aims to promote living close to mass urban transit corridors like the Metros, monorail and bus rapid transit (BRT) corridors. Sustainable Urban Transport Project (SUTP): The project in partnership with Ministry of Urban Development and UNDP aims to promote environmentally sustainable urban transport in India. National Public Bicycle Scheme (NPBS): In 2011, NPBS was launched to build capacity for the implementation and operation of cycle sharing systems across the country. The first public bicycle sharing (PBS) initiative — Trin Trin was launched in Mysuru. Promotion of Electric Vehicles: Indian Government plans to have an all-electric fleet of vehicles by 2030. For promotion of electric vehicles FAME (Faster Adoption and Manufacturing of (hybrid &) Electric vehicles. Under FAME, the Centre subsidizes the cost of electric buses and has sanctioned 390 buses in 11 cities (as of April 2018). Poor Institutional Framework: Functions of Urban transport system are performed by multiple agencies under the central, state and city governments which lack coordination and makes accountability difficult. Land as a Barrier to development of Transport Infrastructure: High cost of land acquisition and time-consuming processes has been a major hindrance to integrated urban transport infrastructure. For example, land acquisition issues have delayed the East-West metro Corridor Project in Kolkata over years. Human Resource Challenges:Lack of urban transport skills amongst city and state officials is a major challenge in effectively implementing transport projects. Leveraging multiple modes of transport – road, rail, coastal and inland waterways, small regional airports, ropeways etc. Data-driven planning and urban transport, with a clear hierarchy amongst different modes- from non-motorized(pedestrians, cycles) to public and lastly private transport. To improve adoption of non-motorized transport, the routes and paths should be planned so that they integrate seamlessly with public transport. To ensure safety for NMT users by outlining norms & dedicated traffic signals should be a key priority. There should be a clear push towards clean technologies. This has to be enabled through ecosystem development which includes domestic manufacturing, deployment of charging infrastructure etc. Well-defined Governance mechanism involving different stakeholders. According to McKinsey report titled “Elements of success: Urban transportation systems of 24 global cities” (2018), Singapore’s public transport system is the best and most affordable system in the world. Nearly 80% of trips in Singapore are performed on Public Transport comprising of bus, MRT, LRT, Taxis. Singapore has one of the highest supplies of public transport per capita in the world. A well planned and extensive public transport system coupled with travel demand restraint measures, like area licensing system, vehicle quota system, congestion pricing etc. has resulted in decreasing registration of private cars and high usage of public transport. Singapore has also introduced “Incentives for Singapore’s Commuters” – a scheme which incentivises commuters to shift their travel time to an earlier or later time belt to avoid the peak travel period on trains and thus avoid overcrowding. In 2014, Mexico City passed a new law which explicitly guarantees the right to mobility and aims at expanding urban mobility through sustainable transportation. The law also created a new mobility hierarchy, placing pedestrians and cyclists above motorists and prioritizing active transport. To address the issues of urban congestion and urban air pollution, it is important to augment mass and share transit capacity and discourage use of private cars by enforcing restraint measures through parking policy, low emissions zones approach, tax measures and congestion pricing. Further, policies toward enhancing public transport should promote inclusive access to mobility. Well engineered, safe infrastructure for travel should be ensured. Further, there is an urgent need to address the issue of low woman mobility by ensuring women safety through gender-sensitive transport policies, dedicated seats/ coaches and emergency helplines. There should be focus on enhancing non-motorised transport. Focus should be to encourage use of non-motorised transport for short distances. Further, Pedestrian zones, bike lanes should be made to ensure safety to commuters. For example, well designated Bike-lanes and bike-sharing solutions have promoted use of bicycles as a mean of transport in cities like Amsterdam and Paris. Commuters should be provided with multiple modes of connectivity. To ease out travelling, a single smart card can be provided. For example, London’s Oyster “smart” card enables a commuter to change from one mode to another with minimal loss of time or effort.